from prnewswire.com: A leading 'abuse case' lawyer is challenging the Catholic Church to open its secret archives of documents for independent examination in order to discover the truth about child abuse by its priests. Richard Scorer, a Partner and specialist in child abuse cases at Manchester law firm Pannone, says, "Every Catholic diocese has a secret archive which is kept locked and has in it secret documents. In the words of the Code of Canon Law, these documents are to be 'protected most securely' and contain, 'matters of morals' and 'criminal cases'. Only the bishop is allowed to possess the key and the archive is only to be opened in a case of 'true necessity'. It is my feeling and that of many of my legal peers that this moment of necessity is here." Says Mr Scorer, "It is like something from a Dan Brown novel, but this is not the Da Vinci Code, it is the Code of Canon Law and it has a bearing on the lives of hundreds probably even thousands of people. In every one of those archives there will be evidence of past scandals, if the Catholic Church really wants to help those children its priest's may have abused in the past, it should open up its secret archives to independent investigation now and cleanse itself of its culture of denial and cover-up." 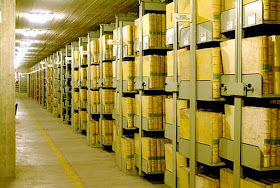 Canon 489 of the current code of Canon law provides: "There is also to be a secret archive, or at least in the ordinary archive there is to be a safe or cabinet, which is securely closed and bolted and which cannot be removed. In this archive documents which are to be kept under secrecy are to be most carefully guarded." Canon law forbids any documents to be removed from the secret archive under any circumstances and only the bishop is permitted to have the key thereto. Accordingly, as only the bishop will know what is in the secret archive, it is obviously unsatisfactory for anyone else to make the disclosure statement. Documents relating to any other matters the bishop considers secret.